Paradise for one! 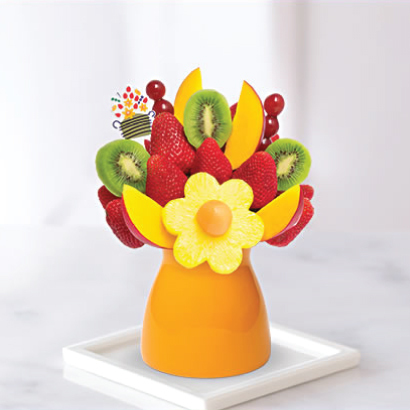 A burst of colors and flavors including mango wedges, juicy kiwi slices, strawberries, grapes, cantaloupe and pineapple daisies are all arranged in a keepsake Edible Arrangements mug. This juicy treat is only available for a limited time, so treat yourself or say get well, I’m thinking of you or thanks a bunch to that special someone! Bouquet will be arranged in a ceramic container or a keepsake Edible Arrangements mug (shown). Container and color may vary.